Titanium foams with aligned, elongated pores are created using a freeze-casting method. An aqueous slurry is directionally frozen to induce ice dendrite formation. The powders are pushed ahead of the solidification front and into the interdendritic spaces. The ice is then freeze-dried, or sublimated, away leaving behind the loosely connected titanium powder foam whose pore structure is determined by the growing ice crystals. Directional freeze-casting had been used with polymers, organic materials, and most recently, in alumina, however never in a metal system. Recently, we have successfully used titanium powders to create by directional freeze casting a titanium foam with aligned, elongated pores . We have investigated the foam microstructure  and its mechanical properties . One possible application for such a foam is as bone implant material, making the foam's mechanical properties and pore sizes especially important for a successful product. Pore sizes in the 100 micron range, the currently accepted size needed to encourage bone growth, have been produced. Mechanical testing shows ductile behavior with low stiffness (desirable to minimize stress shielding) and much higher strength than bone. Chino, Y., D.C. Dunand, "Directionally freeze-cast titanium foam with aligned, elongated pores," Acta Materialia (2007). J.L. Fife, J. Li, D.C. Dunand, P.W. Voorhees, "Morphological Analysis of Pores in Directionally Freeze-Cast Titanium Foams", Journal of Materials Research, 24 (1), 117-124 (2009). J. Li, D.C. Dunand, "Mechanical Properties of Directionally Freeze-Cast Titanium Foams", Acta Materialia, 59, 146-158 (2011). Mechanical properties and pore morphology can be correlated (2). The pores can be filled with nanofiber bioactive materials to encourage osseo-integration (3), making these foams very attractive as bone implant materials. N.G.D. Murray, D.C. Dunand, "Effect of Initial Preform Porosity on Solid-State Foaming of Titanium",Journal of Materials Research, 21 (6), 1175-1188 (2006). H. Shen, S.M. Oppenheimer, D.C. Dunand, L.C. Brinson, "Numerical Modeling of Pore Size and Distribution in Foamed Titanium", Mechanics of Materials. 38, 933-944 (2006). T.D. Sargeant, S.M. Oppenheimer, D.C. Dunand, S.I. Stupp, "Titanium Foam-Bioactive Nanofiber Hybrids for Bone Regeneration", Journal of Tissue Engineering and Regenerative Medicine, 2(8), 455-462 (2008). S.M. Oppenheimer, D.C. Dunand, "Solid-State Foaming of Ti-6Al-4V by Creep or Superplastic Expansion of Argon-Filled Pores", Acta Materialia 58, 4387-4397 (2010). Ti-6Al-4V, with a network of elongated, open pores (micro-channels) aligned along two perpendicular directions, is produced by a two-step replication process (1,2): (i) Ti-6Al-4V powder or foil preforms containing low-carbon steel wire meshes are densified by hot pressing under transformation superplasticity conditions; (ii) micro-channels are created by electrochemical dissolution of the low-carbon steel wires and the adjacent Fe containing Ti-6Al-4V matrix. If high-carbon steel wires are used, Fe diffusion into Ti-6Al-4V is inhibited by a carbide layer forming at the wire/matrix interface, and the micro-channels exactly replicate the shape of the wires. Ti-6Al-4V with ~19% and 34% porosity, without and with Fe-Ti interdiffusion respectively, shows low oxygen contamination and good compressive ductility. Strength and stiffness, as measured by compression testing and ultrasonic measurements, are compared with simple analytical models and numerical finite-element models (2). D.J. Jorgensen, D.C. Dunand, "Ti-6Al-4V with Micro- and Macropores Produced by Powder Sintering and Electrochemical Dissolution of Steel Wires", Materials Science and Engineering A, 527, 3, 849-853 (2010). D.J. Jorgensen, D.C. Dunand, "Structure and Mechanical Properties of Ti-6Al-4V with a Replicated Network of Elongated Pores", Acta Materialia, 59, 640-650 (2011). Open-celled titanium foams are created by vacuum hot pressing of a blend of Ti and NaCl powders followed by NaCl removal in water. Densification kinetics of the Ti/NaCl blends are measured at 780 °C at various pressures (30-50 MPa), NaCl volume fractions (30-70%) and NaCl powder sizes (50-500 m). As compared to pure Ti powders, densification kinetics of the blends is faster for relative densities below 92% due to rapid deformation of the NaCl powders. After dissolution, the flattened shape of the NaCl powders is replicated in the pores, resulting in an anisotropic porous structure. The foams exhibit good compressive strengths (e.g., 102MPa for 50% porosity and 28MPa for 67% porosity), low Young moduli (e.g., 29 GPa for 51% porosity) and ductile behavior up to compressive strain >60%. 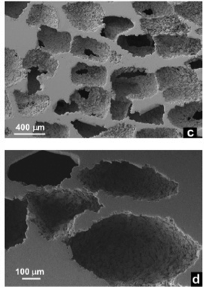 B. Ye, D.C. Dunand, "Titanium Foams Produced by Solid State Replication of NaCl", Materials Science and Engineering A, 528, 691-697 (2010).